This cozy, newly renovated apartment lies in the heart of Prague just meters from the National Museum and a short walk to the main historic sightseeing points. Spacious and tasteful furnishings make this an ideal apartment for a couple or group of 4 with a maximum possibility to accommodate 6 people. The master bedroom faces onto a tree filled courtyard ensuring a quiet and tranquil sleep. The large bedroom includes, in addition to a king size double bed, a fold out couch for 2 people. The separate living room (another fold out courch) and kitchen has a lot of light and the west facing windows offer stunning views to the Museum, which is beautifully lit up at night. In both living room and bedroom there are amazing original pieces of antique furniture which in combination with modern art and other furnishings make a great blend of romantic history and contemporary Prague. The apartment boasts all necessary amenities including fully equipped kitchen, microwave, dishwasher, stove with oven, toaster, kettle, washing machine, massage shower, satellite flat screen TV, radio / CD mini system, DVD player and high-speed internet. The spectacular turn-of-the century building has been recently renovated with new elevator, original features and modern security entrance with surveillance cameras. The area itself is popular with visitors as it’s easily accessible to all major landmarks by foot (1 minutes to Wenceslas square and 6 minutes to the famous Astronomical clock at Old Town square). Public transportation links are superb with easy access to the airport (45 minutes), train (5 minutes by foot to the Main train station) and both metro (Muzeum stop, line A/C, is 1 min. away) and trams. There are many good restaurants, bars, clubs and parks in the area, which is considered to be one of the safest districts in Prague. We pride ourselves on excellent service and will do everything in our power to insure a smooth and relaxing visit to Prague. Feel free to contact me if you have any questions regarding this property or the others which I manage. This apartment has excellent light and most importantly perfect quiet as the bedroom faces onto a tree filled courtyard. Brand new and modern. The shower has several massage settings and is top of the line. A washing machine and a hair dryer are also available. Really good access to the Metro and trams that are easy to navigate. Apartment was clean, spacious, lovely furnishings. The Metro took us to the Charles Bridge in 2 stops, and one comes about every few minutes. We had delayed flights and some mixups with instructions but Vladimir was ever accommodating. Although there were stairs to the apartment, there was also a lift which was much appreciated by my 78 year old mother as well as transporting our luggage. The area was safe and we 3 women felt very secure. Very spacious, great location just on the outskirts of Wenceslas Square. Prague is a beautiful city, everything was within walking distance, Vladimir was helpful at check in about where to find everything. I have only given the apartment 4 stars as I felt the apartment looked a little tired in places, and I believe little extras like a welcome park for later arrivals would be a great add on. Thank you for taking the time to review the apartment we appreciate any and all feedback as we aim to make our guest's experience as comfortable as possible whilst visiting Prague. 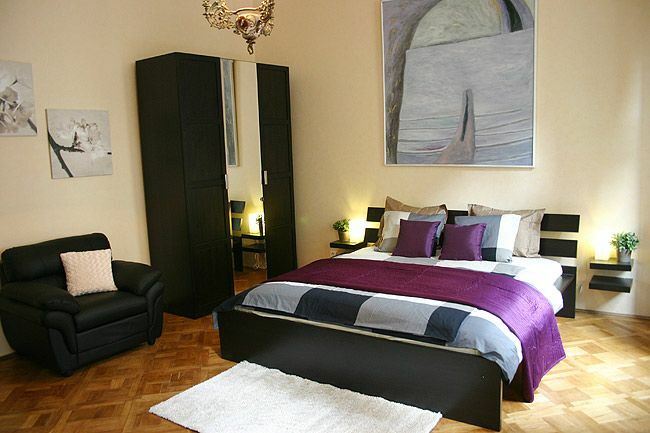 A lovely apartment which was clean, well equipped and well appointed for access into the city. There is a metro station about 3 minutes away, a Tesco Express about 3 minutes away and restaurants close by too. I would highly recommend this apartment to anyone wishing to visit Prague. Thank you for your review, I am glad you enjoyed your stay and your visit to Prague. Good flat in perfect location. The place is really nice, it has everything you may want. Location is perfect - just behind the Museum. Thank you for taking the time to review our apartment, I am glad you enjoyed your stay and your visit to Prague. It was a clean, roomy apartment for a great price! The managers we very helpful and accommodating. Great place to stay in a great location! Thank you for taking the time to write a review, I am glad you enjoyed your stay and your visit to Prague. The apartment was clean and sufficient for 2 people. We arrived in Prague in the evening and were picked up at the airport. I would recommend doing that if you have never been to Prague. The bus station, as far as we could find, was a distance away. It was a very quiet ride on the way to the apartmemt. The apartment itself was clean and neat. I picked the apartment based on price and the ratings. Internet was excellent so we were able to get around Prague based on what we researched. There were a few restaurants around the location. We love to walk everywhere but if that is not your thing be prepared to call an Uber. I really wouldn't know how to get a taxi. Communication, via email, with Petra was good Before we arrived. Thank you for taking the time to write a review. I am glad you enjoyed your stay and your visit to Prague.